My, how time does fly! I haven't posted for half a month or so! Not that I haven't been sewing. Guess I have some catching up to do. I'll begin with where I left off, which would be my samples for summer classes. Now, it just isn't in the least appealing to look at flannel pyjamas as the beginner sewing project in the heat of summer. Right? Needed to remedy the situation. Here's what's hanging in the store now. I was in a great hurry and managed to have the wrong settings on the camera, so the colour's off, but you get the general picture. I cheated. I used my usual no-side-seam-pj-pants pattern because otherwise I would not have been able to fit all the pattern pieces on this border print. I also left off the pocket - I didn't want a "blob" in the middle of the print, and there definitely was not enough fabric to even begin thinking of matching the print. The other sample is Pamela's Patterns Pamela's Favorite Bias Skirt. Colour is way off here. Not grey at all - it's sort of half-way between navy and royal blue. This is such an easy skirt! Takes almost no time to make up. I did hang it for 2 days before hemming. Then came the problem - not a soul to mark my hem. What to do? The solution that I came up with was this: I hung the skirt on that same hanger that you see here against the door of the old wardrobe that lives in my sewing "studio". Sort of like having it on a table, but hanging up. I found the shortest spot. Measured it with a yardstick, then measured from the top, sticking pins all the way around. (took forever!) Marked the pinned spots with a marker and cut off the unevenness (is that a word?). Serged the edge and turned it up and topstitched. I was a little worried about my marking method, but as you can see - an even hem. According to the instructions you're to make a narrow hem turned up twice, but with the weight of this fabric I was afraid that it would be too thick. Oops! Guess I didn't iron out all the wrinkles! A tweak for SBA and a bit added at the hip, and we have a top that fits. I think the trick here is that this style has no dart, which made it easier to fit for me. Don't know that this would work for someone with a large bust. For me - the flatter the better. 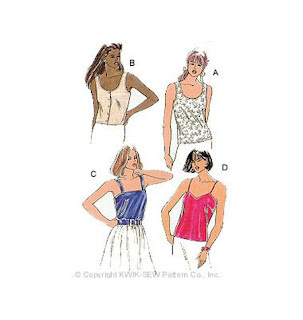 The instructions have you turn under a quarter inch around the neck and armholes and stitch. Not very durable, in my opinion, so I opted for bias "facings". Then came the mess. I started pulling out all sorts of smaller pieces of fabric that would fit this pattern. Littered up the whole sewing room. Then decided that 3 of the same top one after another was quite enough for now. There are other items on the agenda. The mess was corralled into a plastic tub with the pattern, so that when the mood strikes me yet again for a simple top - I won't have far to dig.